A series of custom made plugs to be sewable or soft. 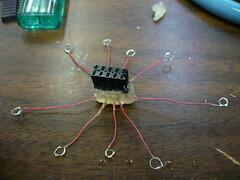 This was used in the Puppeteer suit for the Language Game performance. 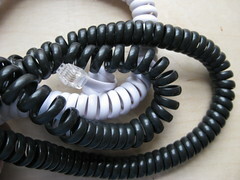 Nice because of the stretchiness of the cable and the sewability of the plug. 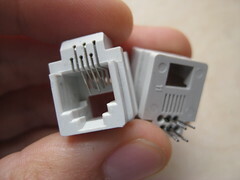 This connection was used in the JoySlippers and Puppeteer Gloves projects. 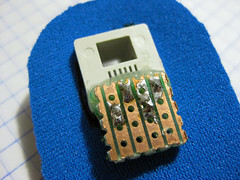 Used in first version of Massage me. 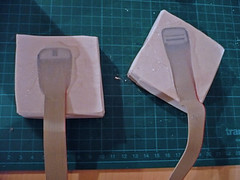 We shaped the plug we wanted from clay and then made a plaster mold to cast them with Dragon Skin silicone. This is a two component silicone that is mixed in a 1:1 ratio (equal parts), which makes it easy to use without precise measuring devices. 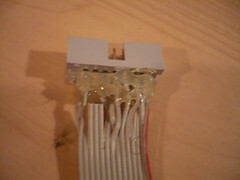 First hot glue around the soldered cable connection to ensure that these will not bend too much, since the silicone is very soft. Then place in mold and add silicone. After the silicone had set we simply tightly sewed some fabric around the silicone and this was enough to keep it in place. This looks nice and neat. 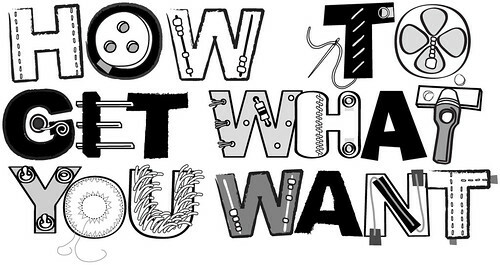 Sugru would do it well, too. unfortunately Sugru and thread don’t always go so well together. sewing tight stitches into sugru cuts right through it. 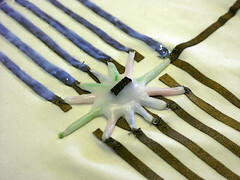 How to make washable circuits or clothes with electronics? 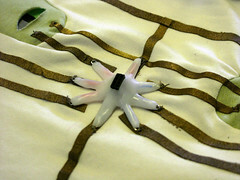 I want put a circuit in my shirt. 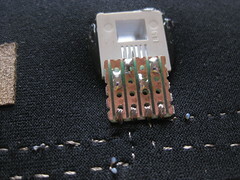 How to wash the shirt without remove the circuit? What are the tips or questions to see to make it washable? ?